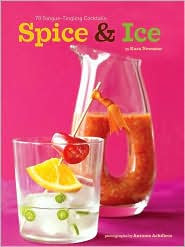 Fiery cocktails are the top trend in drink culture and Kara Newman's new cocktail book, Spice and Ice: 70 Tongue-Tingling Cocktails looks at the genuine union between mixology and spices. NAVAN Natural Vanilla Liqueur, made from 100 percent Madagascar natural vanilla, the world's second most expensive spice after saffron, presents a sneak peek at a cocktail from the book. Mix together all ingredients except for the orange peel. Shake together with ice and strain into a Martini glass. Garnish with the orange peel. Bring the water to a boil in a small saucepan. Reduce to a simmer and add the chipotle pepper and orange peel. Cover and let simmer for 15 to 20 minutes. Strain with a fine-mesh sieve and add the sugar. Return to a boil and stir until the sugar dissolves. Remove from heat and let cool. Pour the syrup into a container and keep in the refrigerator.